Take advantage of low-interest rates, flexible terms and second or third chance credit at Subaru Repentigny. At Subaru Repentigny, we offer accessible, simple financing for your Subaru vehicle. Whether you’re looking to lease or finance a new or used model, lease a new model we have in stock, finance the purchase of a used vehicle, or need second chance credit, we have the financing plan you need at 440 Chevrolet Buick GMC Corvette. 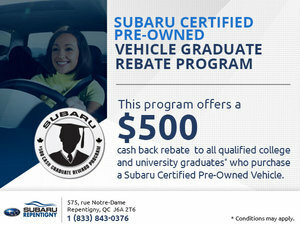 At Subaru Repentigny, we offer affordable financing for your Subaru vehicle. The fast and easy financing process allows you to easily lease or finance a new vehicle, or a used vehicle through our second or third chance credit solutions. At Subaru Repentigny, we have attractive financing offers on all of our new and used Subaru vehicles. We also have several second chance credit financing offers that allow you to buy a quality used vehicle even if your credit isn’t perfect. At Subaru Repentigny, we’re here to help. Whether you’re looking for new vehicle leasing or financing or looking to finance a used vehicle, we are happy to help you at Subaru Repentigny. Our specialists have many years of experience with Subaru financing and will make every effort to find the financing or leasing plan that’s right for you. When you want to find the perfect financing or leasing solution for your next vehicle, you want a dealer you can trust. That’s exactly what you will find at Subaru Repentigny. Regardless of your financing needs, our team of experts will take the time to listen and help you find the financing plan that perfectly suits your needs. Come today and discover our affordable and flexible financing solutions at Subaru Repentigny! At Subaru Repentigny, our second chance financing solutions mean that you can purchase a used vehicle while also rebuilding your credit. We’ll greet you with understanding and respect and take the time to thoroughly explain each option. That way, you’ll choose the used vehicle and second chance financing solution that works best for you. Ready to start rebuilding your credit? To learn more about our second chance financing solutions, contact us at Subaru Repentigny today!